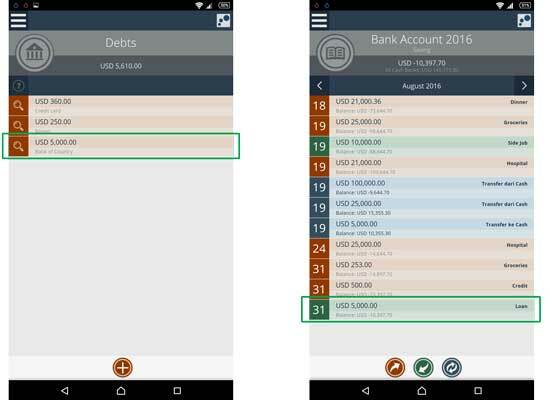 This is the basic tutorial of Debts and Credits feature in Android and iOS. Click here if you want to see the tutorial of the desktop or browser version. Basically between Debts Book and Credits Book has similar way of recording. We split this feature into two pages, the main page that contains a list of Debt or Credits, and sub-pages that contain the details of certain debt or credit. If you are a Premium user utilizing multiusers features, then Debt & Credits can only be accessed by the “manager” role. On the main page, you can add new debts or credits. Tap the “Plus” icon. Enter the data in the pop-up that appears, especially the Amount and Client (name of person / company in which you owe or indebted). 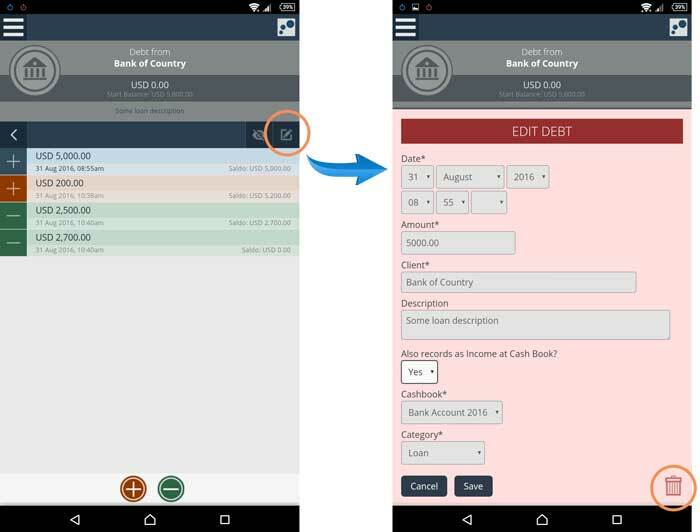 You can also see the question “Also records as Expense / Income at Cash Book?”. If you select “Yes”, then the amount of this new debt or credit will also be recorded as Expense (if debt) or Income (if credit). You can also choose the Cash Book and Categories where this income / expense will be recorded. Save this form, then you will see the result in the list. 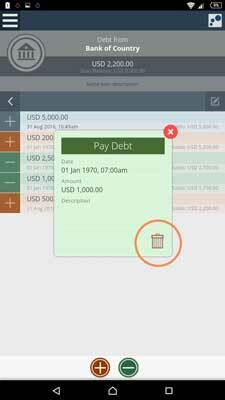 If you also record as expense or income in the Cash Book, this debt or credit amount will also appear in the Cash Book. This features also allows you to record the history of additions or subtraction of each debt and credit. Therefore, the entire activity or installment payment of each debts or credits can be recorded and tracked. 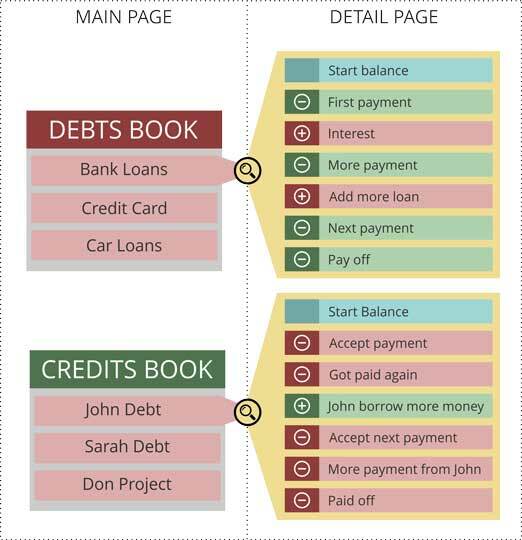 To do so, tap the certain Debt or Credit, then you will see a page that contains the details of the current debt or credit. After saved, then such activity will appear in the list, complete with the balance progress. You can also tap each row of activity, at the pop-up there is [bin] button, which serves to delete the activity. If a debt or credit is paid off then you can hide it. On the detail page of debts or credits you will see the “Hide” icon. Tap on the icon to hide the current debt or credit from your list. If at later time you need to see the history of these debt or credit again, then you can re-display it. 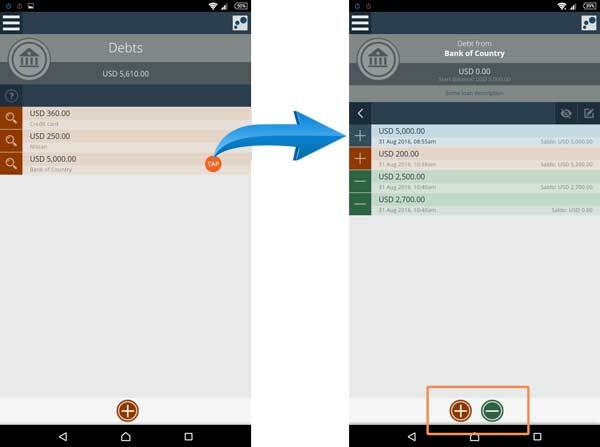 Just tap the “show” button contained in the debts or credits list. Note: This icon only appears when there are hidden debts or credits. The initial amount and the properties of debts or credits can be edited via the “Edit” icon that appear on it detail page. Use this icon to change the initial data. You can also use the “bin” icon that appears in the pop-up to delete or cancel such debts or credits.